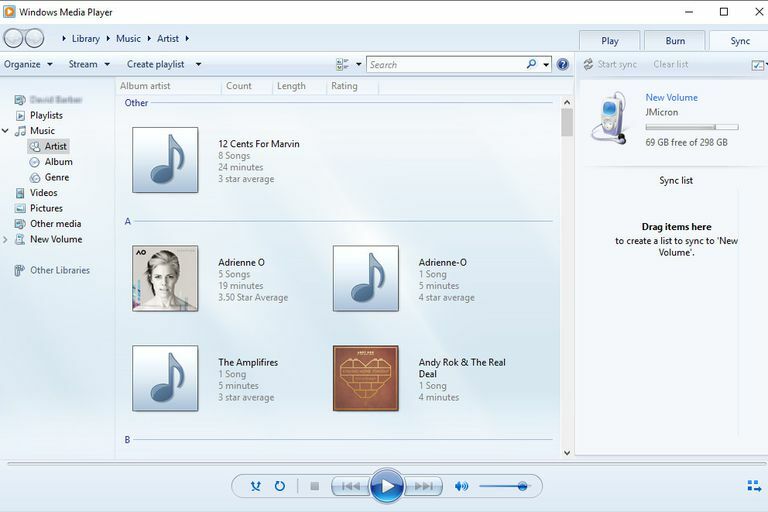 Windows Media Player 11 is an older version of the application. However, if you still use this older version as your main media player (because you may have an older PC or are running XP or Vista), then it can still come in very handy for syncing files to portable devices. You may have a smartphone, MP3 player, or even a storage device like a USB flash drive. Newer versions of WMP also have very similar sync capabilities. Depending on your device's capabilities, music, videos, photos, and other formats of media files can be transferred from the media library on your computer and enjoyed while on the move. This tutorial will show you how to do this easily. You'll also learn how to use Microsoft's media software program to automatically and manually sync files straight to your device. If you need to download Windows Media Player 11 again, then it is still available from Microsoft's support website. Sync menu tab in WMP 11. By default, Windows Media Player 11 will select the best synchronization method for your device when it is connected to your computer. There are two possible ways that it can choose depending on your device's storage capacity. This will either be automatic or manual mode. Automatic Mode. If a device you connect has 4GB or more storage, and the entire contents of your WMP library will fit on it, then this mode is used. Manual Mode. This is selected by WMP when a device you plug in has less than 4GB of storage space. Click on the Sync menu tab near the top of Windows Media Player 11's screen. Make sure your device is powered up so Windows can detect it, usually as a plug-and-play device. Connect your device to your computer using the provided cable once it is fully powered on. The sync button in WMP. As previously mentioned, Windows Media Player 11 will select one of its synchronizing modes when you have connected your device. If Windows Media Player 11 is using the automatic mode, simply click on Finish to automatically transfer all your media—this mode also makes sure that the contents of your library do not exceed the storage capacity of your portable device. You don't have to transfer everything to your device in automatic mode. Instead, you can select which playlists you want to transfer each time your device is connected. You can also create new auto playlists and add them, too. Click the down arrow below the Sync menu tab. On the Device Setup screen, choose the playlists you want to automatically sync and then click the Add button. To create a new playlist, click the Create New Auto Playlist and then choose the criteria that will determine which songs will be included. To setup manual syncing in Windows Media Player, you'll first need to click Finish when you have connected your portable device. Drag-and-drop files, albums, and playlists to the Sync List on the right-hand side of the screen. When you are done, click the Start Sync button to begin transferring your media files.